Everybody has a hobby with some it’s football, golf or a combination of sports, while my interest lies in the photographing,history, restoring and showing fire engines. Can you member the first time you were on holiday or attended your first football match ? Well I can recall the first time I seen a fire engine .I was about 5 years old my father was holding me by the hand to walk two doors up to the house of Jimmy Dunphy who was a D/M with Athy Fire Brigade. Outside was parked an Austin Fire Engine. That was the day I caught the BUG. 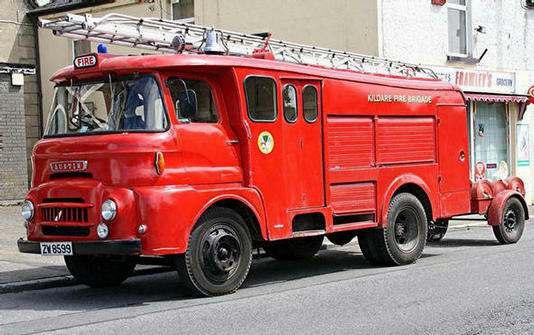 That same fire engine was 4 years old and new to Athy Fire Brigade, today that Austin fire engine I first saw over 40 years ago (photo above) forms part of a collection of fire engines cared for by myself and my family here in Athy. During my childhood I attended drill nights and as the fire station had no drill yard, I got to ride from the station to the drill ground in the Austin. As I got older I joined the A.F.S. and spent my summer holidays attending fires in the Athy area. In 1998 I acquired my first appliance a 1976 Dennis ‘R’ again new to Athy, it replaced my Austin when it was stepped down from first away. Aquiring my first appliance was only the start of my troubles, there was no club or organisation in Ireland catering for appliance owners and no insurance company willing to insure them. So I asked about 20 people who had appliances or had a great interest in preserving fire appliances to attend a meeting on 19th January 1999 and on that day in the front room of our house in Athy, The Irish Fire Service Preservation Group was formed or better known today as the Fire Service Trust. Members of the group attend shows and functions with their appliances helping to preserve our heritage and raise much needed funds for charity. Browse the pages of this site which will be continually updated. if you have a photo or an article you would like to share I will only to glad to post it for you. If you see something on the site that is not correct please let me know. úinéirí fearas agus aon chomhlacht árachais atá sásta iad a árachú. Mar sin, d'iarr mé ar thart ar 20 duine a fearais raibh nó a raibh suim mhór i gcaomhnú na fearais dóiteáin chun freastal ar chruinniú ar an 19 Eanáir, 1999 agus ar an lá sin sa seomra os comhair ár dteach i mBaile Átha Í Bunaíodh an Grúpa um Caomhnú Seirbhís Dóiteáin Gaeilge nó níos fearr ar a dtugtar inniu mar an tSeirbhís Dóiteáin Iontaobhas. Baill den ghrúpa ag freastal ar seónna agus feidhmeanna lena n-fearais cuidiú ár n-oidhreacht a chaomhnú agus i gcistí ag teastáil go géar a thógáil do charthanacht. 1962 Austin FFK / Griffith J. Roberts, ran out Athy from new to 1976.